Emma Rose lives in Sydney Australia and was willing to travel to Brisbane to meet with me and hold our initial cosmetic dentistry consultation. In this appointment I learned about Emma Rose’ smile requirements and I also completed the necessary diagnostics which assisted us in coming up with a precise cosmetic dentistry treatment plan. For those of you who don’t know Emma Rose, she is a health, lifestyle, fitness, beauty and fashion blogger based in Sydney Australia. She also is a co owner of Online Marketplace BuyMyClothes.com, a fashion portal where you can buy, sell and trade new and pre loved fashion and accessories. She is often in the lime light with her instagram page Emma Rose Official and involved in many other media opportunities. Therefore, her image and smile is often very important to her personally to her career. One of Emma Rose’s smile design requirements was to make her smile look wider. As an adult, widening your smile using orthodontics can be achieved but can be limited in the result as an adult. Emma Rose also wanted very high quality treatment work as she had worked with previous dentists but was not happy with the results or the treatment. Understanding this made us both realise we needed to apply the highest quality type of dental veneers. To maximise our results for Emma Rose, we decided to pursue Porcelain Veneers. 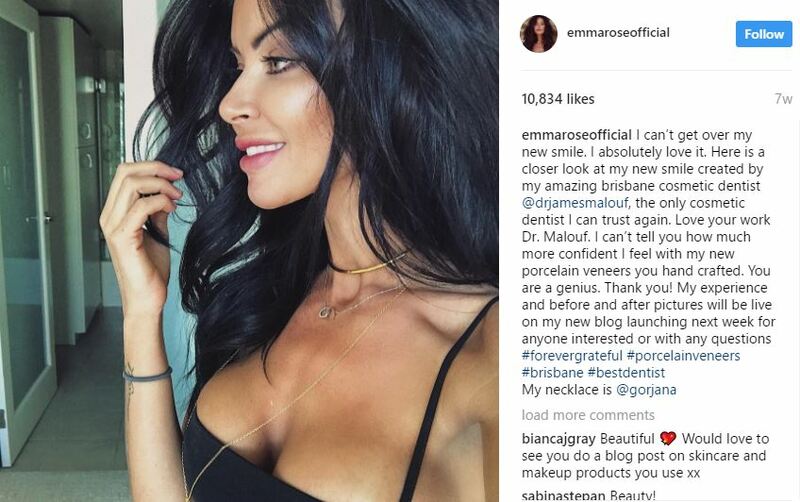 As you can see from Emma Rose’s blog post and instagram page, she is very content with her new smile transformation and porcelain veneers.